29. Unplug for a week: I’m a Facebook junkie. And, why shouldn’t I be? With 5 siblings scattered across the country and friends from Palmer, Fairbanks, Atlanta and Cincinnati, I like using Facebook as way to keep up with all of them. It’s quicker and easier than writing regular emails. But, it doesn’t stop with Facebook. I also enjoy checking Twitter, Instagram and Pinterest. So, I’m shutting down for the week: from December 24th to December 31st. No Facebook. No Twitter. No Instagram. No Pinterest. No personal email. No reading/writing of blogs. No random Internet surfing. 1. I will be using my phone for phone-things: calls and texting (people need to be able to get in touch). I’ll also use it as a camera as it’s the easiest camera I own to use. 2. I will check my email via my phone to weed out commercial messages (you wouldn’t believe how many store/website emails I receive in order to stay up-to-date with trends. (I really don’t feel like opening an inbox with a million messages once I’m back online.) Also, if I receive a bill via email, I will pay it via Internet–we do live in the future, folks. 3. I’m probably going to be online for work–it is kind of the business I’m in. And, I’ll probably have to log into Facebook for work-related reasons. It’s just the biz. I’ll just stay focused. 4. If there’s urgent information relayed through Facebook messages (one of my family’s favorite ways to tell everyone some news at the same time), I will break my hiatus. Of course, someone has to tell me, probably via text or phone, to check Facebook. I think that’s it. I’ll see y’all back on January 1, 2013 and let you know how things went! I’m hoping to return refreshed and revived. 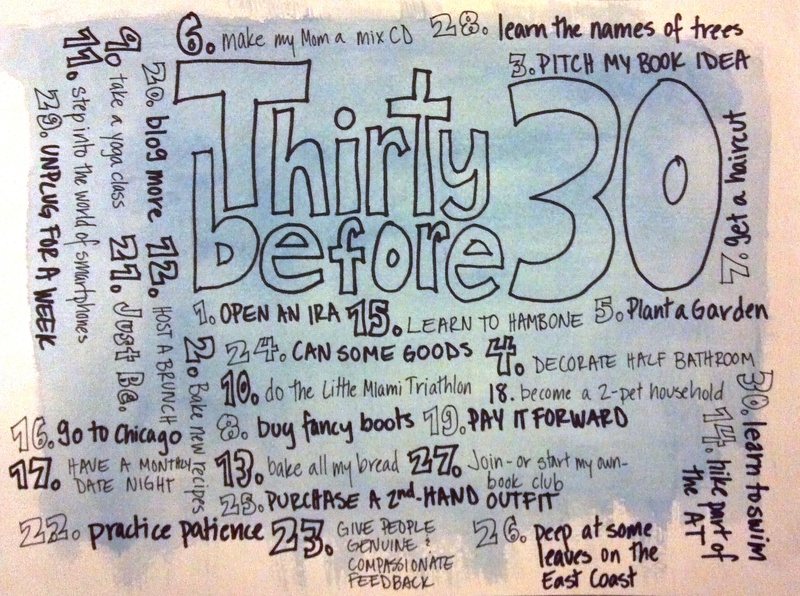 Thirty Before 30 Update: Number 29 Done!